"Not your normal every day baked potato. 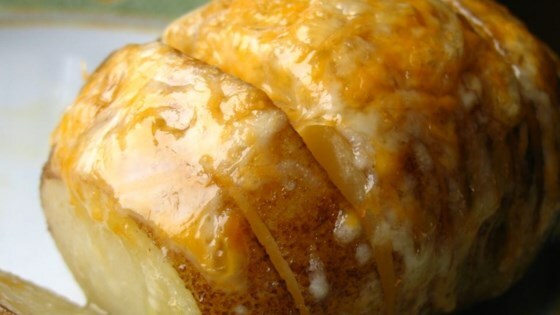 Potatoes are cut into connected slices before being seasoned and baked. I leave the skin on (it gets crispy and yummy), but this can be made with them peeled also." Preheat the oven to 425 degrees F (200 degrees C). Slice the potatoes crosswise (the short way) into 1/4 inch slices, leaving about 1/4 inch on the bottom to connect all of the slices. Place into a baking dish, and slightly fan the slices open. Sprinkle with salt and seasoning blend, and drizzle with butter. Bake for 50 minutes in the preheated oven. Sprinkle cheese over the top, and bake for another 10 minutes, or until the cheese has melted. I thought they were quite good! I put two wooden spoons along the sides of the potatoes, so it was very easy to slice evenly and without going all the way thru.